Nov 16, 2018 ~ Ospreys are such magnificent raptors. Each fall we look forward their presence along waterways and ponds. 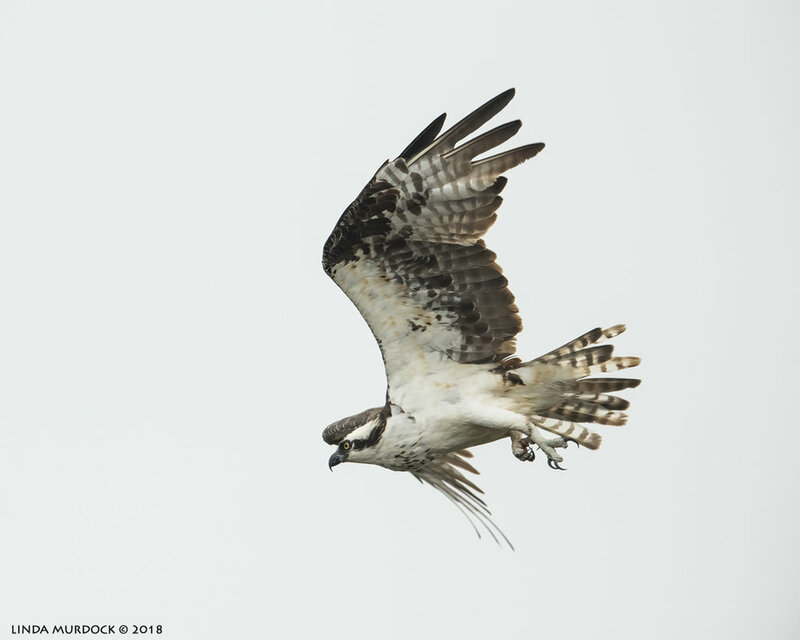 We do have a few year round; juvenile Ospreys can stay up to four years in their winter habitat, presumably mastering fishing skills before returning to nesting grounds in the Great Plains. 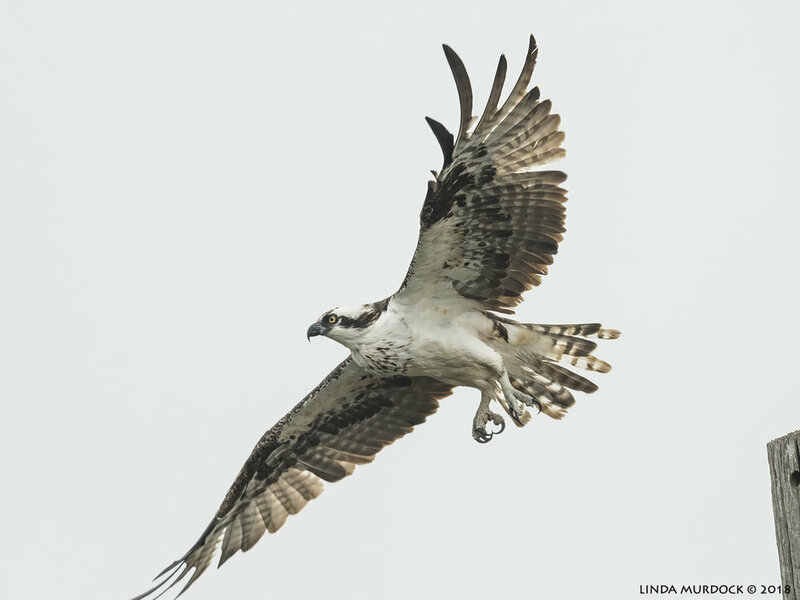 I have written about them several times in the past; Fish Hawks in 2014 and October Ospreys in 2016 plus now and then in other stories. This post is going to be a discussion of behavior, settings and techniques with the goal of getting better at birds-in-flight, so if that is not your interest, then you are welcome to just look at the photos - but you never know what you might learn! We found this guy (or gal) on a short pole alongside Sportsman Road in Galveston. I think Bill Maroldo pulled the truck up as far as he dared and we just sat and watched him for a while. When he didn’t immediately bolt we were encouraged. I slipped out on the passenger side and propped the big lens in between the door and truck frame. It is a good spot; you have a bit of support and are partially hidden by the vehicle. If you walk out and show yourself, he will fly. If you lean across the vehicle hood you might get heat waves affecting your image. Sneaking around the the back of the truck and using the bed for support can work, but it gets uncomfortable for me (being short and all). Like I said, it is a good position if the bird is not on '“your” side. I have whole series of him posed on the pole. How many? I took 21 practically identical shots during the minute before he flew. Not wasted time at all; this is the opportunity you use to check your settings and exposure. It is helpful to have all the pertinent info showing in the viewfinder. And you want to make any changes using the front or back command wheel without taking your eye off the bird in the viewfinder. What I mean is you should know where all the buttons/wheels are on your camera and be able to manipulate them by touch or feel without looking at the camera. If you drop the rig down and make your changes by looking at the top display or have to hunt for the buttons, the bird will probably be gone when you get back in position. Shutter speed - Is it high enough? Try for at least 1/2000 sec or even more because he is eventually going to fly. Exposure - over or under exposed? Take shot. If you have Image Review ON the shot is displayed for a few seconds on the LCD screen. Just glance at the overall brightness. Without my reading glasses I have no idea if it in focus but I can definitely tell if it is too dark or too light. Adjust ISO as needed. Repeat and see if it looks better. You can learn to do this really quickly. Aperture - A setting of f/6.3 is enough Depth of Field (DOF) for my set up as he is far away (at least 50-60 feet). You can experiment with a DOF calculator to get a feel for how much DOF you get at what distance and focal length. I am shooting 500 mm with 1.4x converter = 700 mm focal length. My DOF would be different at the same distance and aperture if I was shooting the 300 mm with the same converter (410 mm focal length). This is a setting you learn by practice and experience. Yes, I know you can shoot automatic but you may end up with too slow a shutter speed or an underexposed image. Focus mode - Taking advantage of specialized autofocus modes for a bird that is going to fly can improve your keeper rate. With the permanently-on-back-order Nikon D850 I am having really good luck with the 3-D tracking mode especially when the background is plain sky. My camera is customized to where I can use Single Spot (activated with a programmed Preview button) while the subject is sitting still and then as he starts to fly I take my finger off the button and the 3-D tracking mode activates. Some people have good luck with Group mode; I also use the Dynamic 9-spot. Read up on your camera’s autofocus modes and experiment. 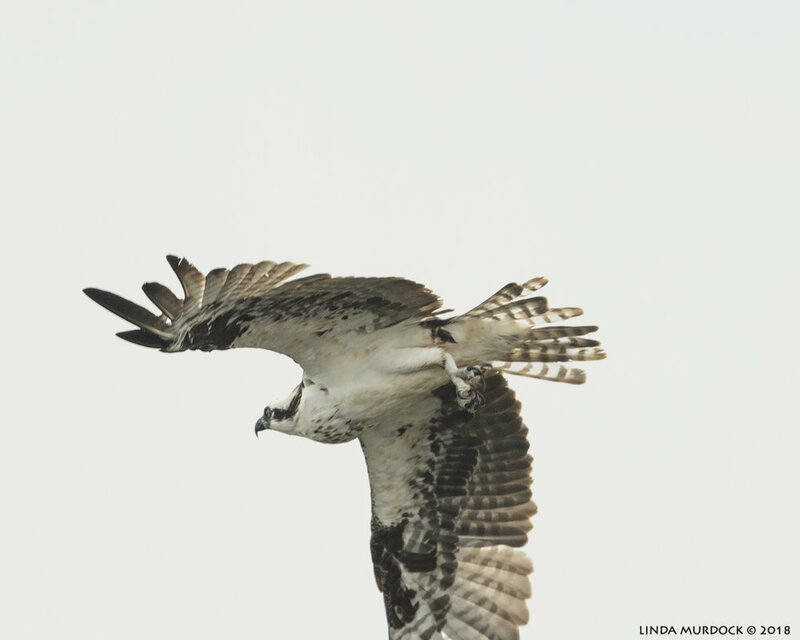 The Osprey called out again and when he began intently staring at us… I knew he was going to fly. It can’t be emphasized enough that knowing your subject and anticipating movement makes you a better photographer. This is the very next shot from the stare down one above. He starts to raise his wings. The lifted foot indicates he is going to turn to his right (away from me) when he takes off. How much he is going to turn is a mystery. This is where I switched over to 3-D focus and got it locked on his head. Next shot he fully extends his wings. Right foot is almost down on the post and he is calling again. I am really stoked because I can just tell the shots are going to be good. The Nikon D850 has a continuous shooting rate of 7 frames per second Just hold down the shutter and try to keep up with him. This is where good equipment rules the day. A camera capable of shooting a high number of frames per second with fast autofocus can capture a whole sequence of movements. A large buffer (to hold the info) and a fast card (to write the data) is also important. And lift off! Look at how straight his legs are from pushing his weight off the pole. Wings are out, almost flat. Stay focused on his head and follow the movement. The wings go up to lift his body into the air. Look at his legs now; they are loose and almost dangling from his body. They have done their job. His body is slightly above the post. Wings out to get more lift. And look at that head. He is looking slightly to his right and letting you know that is the direction he is going to turn. Now check his body in relation to the pole. He was above the pole, now he is about even with it. The turn and dip has been telegraphed to you. See how he has turned to his right and away from view? The angle of the head is not ideal in this shot for photography, but notice the downward tilt of his body. And this image only shows the near wing; the other one is almost hidden by his body. Not a keeper but it does illustrate the flight movements. He drops his right wing and this is a full bank as he turns away. The very bottom of his far wing is clipped; I didn’t lower the lens enough to keep him in the frame. And the last one (definitely not a keeper) is for … illustrative purposes only. He has turned and is flying away and down. If you embiggen this one, you can see I am losing focus on his head (but his feet are sharp!) as he flies away and the wing is out of the frame. On second thought, don’t look that closely! What did I say last week? If they are up high, they fly away and DOWN. I need to learn anticipate that downward dip. It is one thing to know something, but acting on it is the harder part. When they fly we expect them to fly UP but that isn’t always the case. Note: I want to clarify that I shoot completely manually. I set each parameter (shutter speed, exposure and f/stop) individually. I do not use Auto ISO or Aperture or Shutter priority or Exposure Compensation. I don’t even know how to use those. I got some mail last week that makes me think I might not have been clear about that. So, on with our observations. Do you analyze your own shots? Do you look at the sequence of the images, the settings and try to figure out how to do better next time? I swearz, studying my photos and writing up my efforts in this blog has helped me improve. And more practice. It is hard to get really good if you are only able to shoot for a short while now and then. I know I do much better with exposure now; this entire set had the exposure raised a half-stop, shadows opened a little bit and a touch of clarity in post-processing. That is all. The film strip above shows the processed and cropped images. Ten images in sequence and all in focus. Now that exposure is not so much of a challenge as before, I look more closely at the details. Is the head sharp? Is the eye showing and clear? Is the head angle good? A head turned and facing away is not as pleasing. A good head angle establishes a connection between the bird and the viewer. This is the Osprey from last week at Surfside, but even though he is flying AWAY, the head angle is near perfect. Looking at my own photos I ask … are the wing tips in focus? A little bit of blur when the head and body are tack sharp can suggest motion, but I like the whole bird to be in focus. If the wing tips are blurry it could be shutter speed but probably is depth of field. Again, play around with the DOF calculator to get a relative sense of the possibilities. Knowing what your own equipment can do at various distances adds to your skill set. After looking at the technical aspects, look at the overall appearance. Sometimes the wing position is just off or uninteresting. Wings fully up or down usually work as it can minimize shadows on the body and flat out pancake-style can look interesting or… odd. The background may be too prominent or busy, with distracting out-of-focus birds sharing the space. And often a photo is technically good but it is just … ordinary. Learning to honestly analyze your own work or asking more skilled photographers for critique can help you learn. Simple things such as a lopsided horizon, no space for virtual feet or loss of image quality due to severe cropping are obvious when pointed out. Post-processing work can also be overdone. Posting on FB and getting a bunch of “awesome” comments is fun and certainly can make you feel good, but receiving well-thought out technical critique of an image can be educational and give you feedback on where you need to improve. Aesthetic critique is often harder to accept but can be valuable when given by a more accomplished photographer. Do you analyze your own work? Do you study other photographer’s images on Flickr or other sites on line and wonder how they got the shot? Do you have a plan of how you intend to improve? Let me know in the comments below!